Kind of strange to take a lore guy like Byf and have him do a gameplay reveal. Anyhow, it looks sweet. Datto also says that this game is more focused on abilities. You can really make a build like that. So that shooting your gun isnt something you do alot. You can really spec to focus on abilities and cooldown wich is pretty cool. That Lore vid from Byf is pretty great. Looks like on Xbox One X also. Also i love that the freelancer has a voice. I will buy it day 1 to play with friends even if I'm not totally convinced yet, but this truly feels like it will be the financial success that BioWare and EA have been searching for so long, game will be big. The more I see with the alpha representing the foundation has me day 1 on this. Flying around looks incredible, can't wait to play this. I'm so close to being completely sold on this. I'm just apprehensive about the content we're getting in the final base game. As in, how much of it is there? Like I said in the other thread, Spark Dash is just the Vanguard Charge lmao. Yuuuup. So long as Colossus brings my krogan smash I'm happy. I haven't followed the game too closely (I did play the closed alpha though) but from what I've been hearing here and elsewhere BioWare is only ever showing off the jungle biome. So if environmental diversity is an aspect of content in your book (it sorta is in mine) then maybe you'd do best to check out impressions/reviews first. 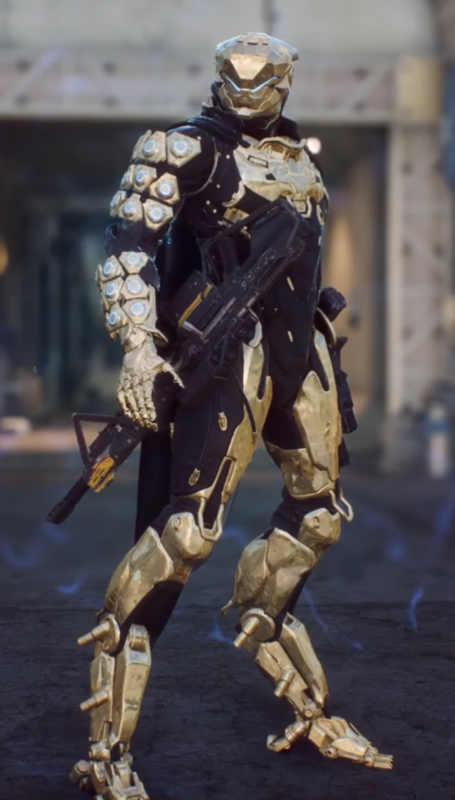 Is that Javelin using Volt Tackle ? Yes I'd expect different environments in the game. I probably would be best off reading reviews and finding out just how it turns out as not to be disappointed. What I'm hoping for, is a decently lengthed loot/upgrade driven experience. I love the aesthetic already, the suits look great and the game play looks fun and stylish. I just need the play ground to be robust. Rebuilding my OP Mass Effect 3 Vanguard build with the Interceptor. This definitely is Neo-BioWare. I'm probably getting it, but only to see what story the veteran writers crafted underneath all this. Someone did a good a color scheme for the storm finally. This will be my “Destiny”, more of a third person gamer myself. From the alpha and other footage out there we haven’t been shown much. The jungle and underwater structures seem interesting enough and worth exploring but I would not expect worlds/terrain similar to Destiny which benefits from visiting different Planet/Moons that have old structures and cities to explore made by various sentient races. I've not been following the game a whole lot but... where's the loot? but I saw mention of Hive and cringed a bit. Love the Storm class, but the gameplay for it looks a bit one note. Is this game a TPS with RPG elements? When are we getting a proper demo/beta? Fine by me. Hopefully there's more mass effect like abilities and animations. Mass Effect 3 Vanguard's Biotic Charge Redux Part Deux? Looks good and so generic at the same time. Also sounds and looks so Destiny. I just hate that British/chirpy/robot dialog. That's amazing news to me. The guns in Destiny are fun to shoot but I heavily prefer using abilities in games over using guns in games. I always preferred the frames in Warframe which played more like a spellcaster. So no single player story or a fake one like Destiny? The focus on abilities over the guns themselves is huge to me. The game was already barking up the right tree with me with a focus on co op PVE and being a scifi third person shooter but being able to focus on the crazy abilities is what really speaks to me more than some of the other looter shooters out there where its guns guns guns. There’s a single player campaign with side missions as well. Which one is like my Blood Reaver in Dragon Age? Really? Might look into it now. People asking about a story and such. There is a long single player story with cutscenes, characters, villains and such - this story can be played solo or with others in co-op. There are also a variety of side missions, world events and other small tasks to do in the open world. This looks awesome. I want my Storm to be black and white with hints of blue. This is a great look for the Storm though. The Storm looks so fluid and elegant through its destruction. I think I’ll be a wizard as well once I get there. It was the same content from various perspectives using various javelins. I think it’s kind of cool to see Datto and his more technical take and then see Byf with his story takeaways. I’m pumped. In the boxes! lol Sorry. Looks good but it’s a wait until It’s 100% confirmed by players that mxt aren’t garbage tier bs. Unless something changes it sounds like its just cosmetic items and the story/expansion content will be free for players. Can all the missions be played in coop? Yep. Co-op or solo. The intro mission may be single player only as many games tutorial levels are but we have no idea if that’s the case. I'm glad to hear that abilities have much more faster cool downs leading to more usage. That was a big complain of mine back in Destiny 1. Will there be DLC packs or is it just cosmetic microtransactions? I'm truly wondering if this game is worth it at all for someone like me, who most likely won't be pairing up with people.